This black men’s t-shirt shows the moon and it’s a full moon and in front of the moon you can find a witch and she is flying around on her broom. My guess is that the witch is getting ready for Halloween and trying to see what houses would be best for trick or treating. This witch has a soft spot for candy corn and she just needs to make sure that she found the mother load. 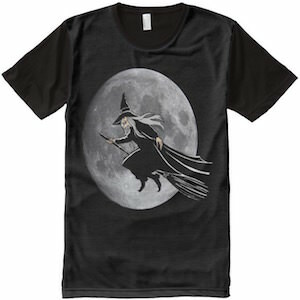 This black witch t-shirt comes in men’s sizes Small – 2XL and sure the ladies can wear it to of course.